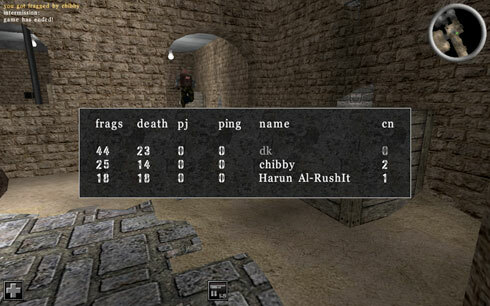 AssaultCube – An awesome FPS game for Linux. Based upon the Cube engine, AssaultCube is a fast paced, first-person shooter, (partially) open source, cross platform game. Formerly called ActionCube, this game can be played both online with hundreds of other players from around the world or in a single player mode against computer controlled bots. There are two different teams in AssaultCube, called the Cubers Liberations Army (CLA) and the Rabid Viper Special Forces (RVSF), with 12 different game levels excluding the single player mode. The game delivers a realistic environment while being very gracious on system resources. Testing it on a 512MB RAM and 2GHz Intel Celeron processor Ubuntu powered box, it run great both in the single player mode and online. AssaultCube retains a movement bug from the original Cube engine that allows players to utilize straferunning to move at a faster speed. This was left intentionally unfixed by the developers because it was considered an enjoyable feature of Cube, similar to bunny hopping in Quake. Another rather unrealistic feature of the game is the potential for using the recoil of the weapons (which pushes one backwards) to reach and perform moves that were previously impossible. This was also included intentionally, allowing players to achieve faster movement and jump higher. This feature was inherited from Cube, though it was absent in the original release of AssaultCube. AssaultCube’s weapons are all fictional and fill the basic niches of a modern first-person shooter: the assault rifle, sub-machine gun, sniper rifle, pistol, knife, and shotgun. The installation file is an incredible 40MB and is available for download for Windows, Linux and Mac OSX. For Linux users, just extract the downloaded file and navigate to the directory where you’ve put it, then issue the assaultcube.sh command. Linux gaming has always been a bit of a sad story. I'm sure there are great games, but they are almost always years behind in technology compared to those found on gaming consoles and PC. I think the open source model unfortunately doesn't quite fit the gaming industry. Games are usually developed rapidly, released, played for a year or two and then die. As such, most open source developers feel their efforts would be wasted developing a games that eventually most likely will be forgotten. Game engines on the other hand may fit the open source development model perfectly. Game engines can modified, extended and hacked to support e.g. new graphics, sound or A.I technology. Therefore I find it interesting that Cube also released their gaming engine. Yea Helge, Open source has yet to find its rhythm when it comes to gaming. But I think some progress is being made. Like you said, once the engine is available, there'll always be people to do the hacking. There only needs to be one groundbreaking open source game and the rest will fall in place. The Cube engine btw I think is just awesome. On another note I like the fact that Cube is cross-platform and released under the zlib license. This will actually allow game developers to develop commercial games with it. I don't really see a problem with that. Just hope they will realize the importance of contributing as much as possible back to the Cube engine. That would be what I would call open-source-proprietary symbiosis! What I mean is should there be one open source game with a full time commercial backer that attains a certain level of success, we'd surely have the hackers coming on board. For sure, I agree. Any thoughts on how to commercialize an open source game? Simple. Produce a world class game licensed under GPL, then build a very attractive eco-system that will add extreme value to the base game. Something that people will not hesitate to pay for. Doesn't matter if the eco-system is fully closed source as long as it can be a cash cow. One idea that comes to mind is MMORPGs where the game+engine could be open sourced while the server side software kept closed. Thus, gamers will pay e.g. a monthly fee to play the game online but will still be able to commit bugfixes, patches, and add new features and content. I believe WoW has shown that gamers are more than willing to contribute to a game they enjoy. Perhaps they can also be given in game or real world credit for valuable contributions. Precisely. All that's needed now is a serious initiative of its kind from the open source side. Previous PostPrevious Google, Microsoft and Open Source – The bottom line is supreme. Next PostNext DVD Flick – A free professional DVD authoring tool for Windows.